Make the sauce: On high heat with a splash of oil, brown the meats until they are cooked through. Remove from pan. 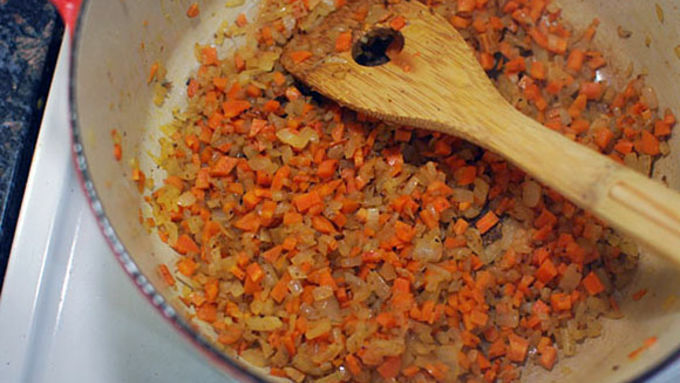 Add the carrot and onion and turn the heat to medium. Cook about 10 minutes, stirring often, to soften and lightly brown. Add the garlic and cook one minute, followed by the tomato paste. 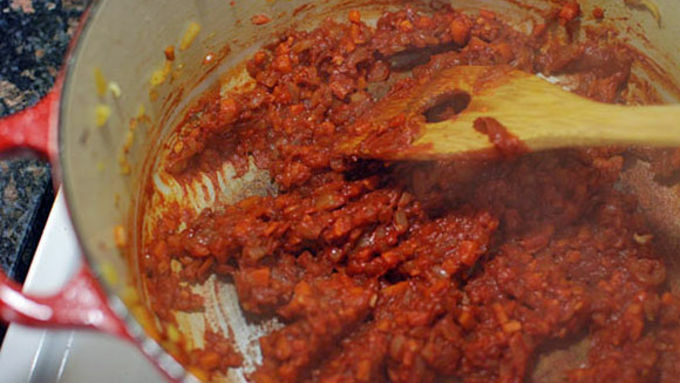 Cook the tomato paste in the pan, stirring constantly for about 3 minutes. Add in the wine and bring to a simmer, combining everything. Add in the cooked meats, crushed tomatoes, cream, Parmesan, and oregano. Taste and add a little salt if needed. Let this mixture simmer lightly for about 1.5 to 2 hours. Make the tamale dough: Bring the chicken stock to a simmer. Whisk in the cornmeal and remove from heat. Stir in the masa harina, Parmesan, and pepper. Keep stirring as it thickens and it should eventually come to the texture of a thick peanut butter. 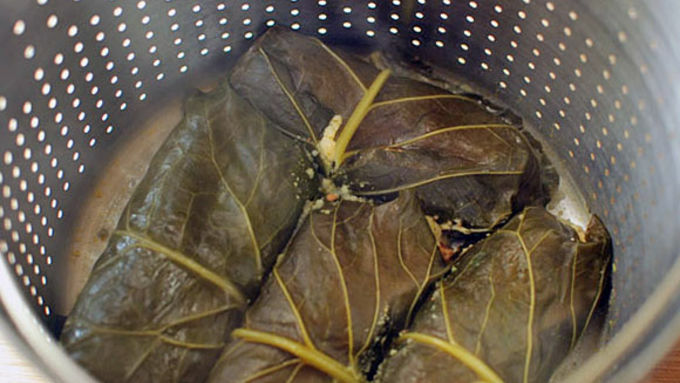 Assemble the wrap: Remove some of the very thick stem from the center of each green leaf. Lay a leaf out on your work surface and spread with some of the masa mixture. Top with a scoop of the bolognese sauce. Roll up the tamale in the leaf making sure the corn dough is sealed around the sauce. Place the tamale into a steamer. Repeat with the rest of the tamale dough, and steam the tamales for 45 minutes to an hour. Allow to cool for 5-10 minutes before removing from the steamer and serving. My favorite thing to do in the kitchen is taking flavors from one type of ethnic cooking and presenting it like a dish from a different cuisine. 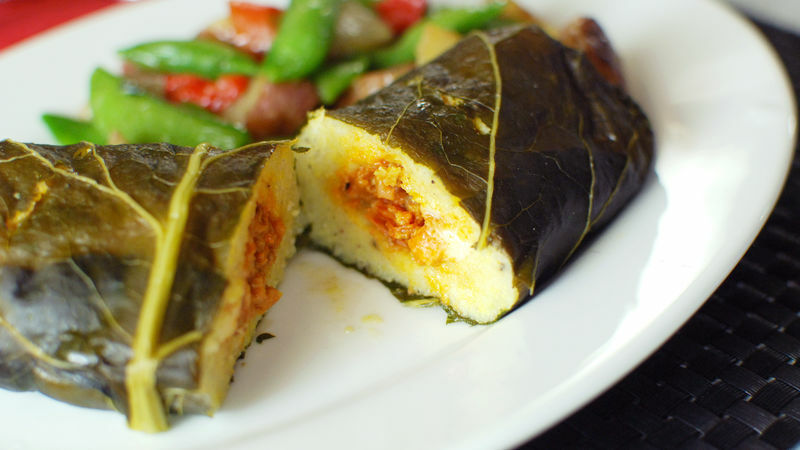 These Italian Tamales are a great example of that. 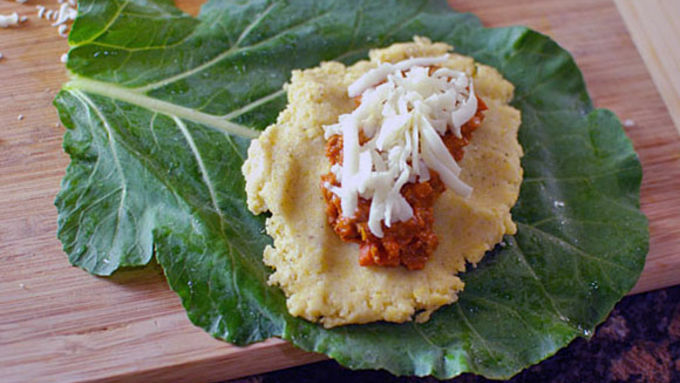 Normally a corn flour-based dough makes up the bulk of a tamale; this one is polenta. Normally a beefy taco meat filling is used in a tamale; this is a meaty Bolognese. When they didn't have corn husks at the grocery store, I had to improvise. Instead, I used leafy hearty collard greens. Now instead of just tossing the wrapper, we can actually eat it! 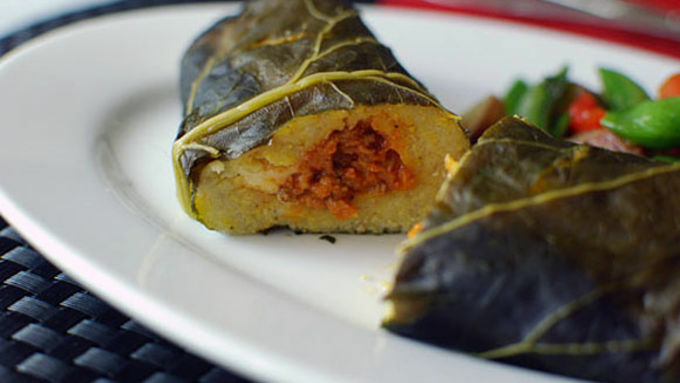 These tamales are a unique treat that blends Mexican and Italian food seamlessly, and somehow manages to be familiar and new at the same time. As I mentioned, the best part about using a collard green instead of a corn husk is that the wrapper is edible. Serve these with a side of veggies and you have a meal with classic flavors done in a new and elegant way. The cheese and meat really goes perfectly with the corn cake. This is one of the best meals I’ve had in a while!